The ssk (or slip, slip, knit) is a has a rather counter-intuitive name because it is not really as it seems. 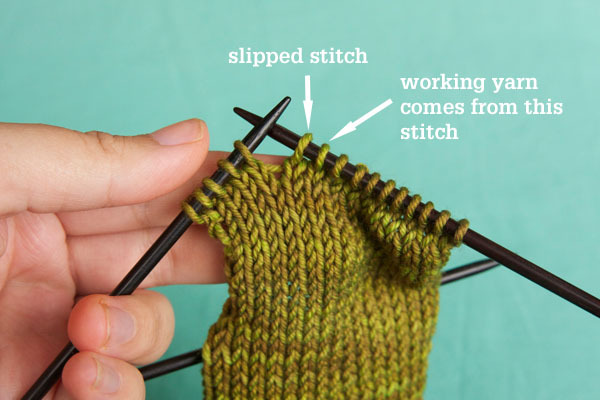 You are doing more than just slipping and knitting, you are in fact decreasing a stitch by slipping two stitches and then knitting them together through the back loops. 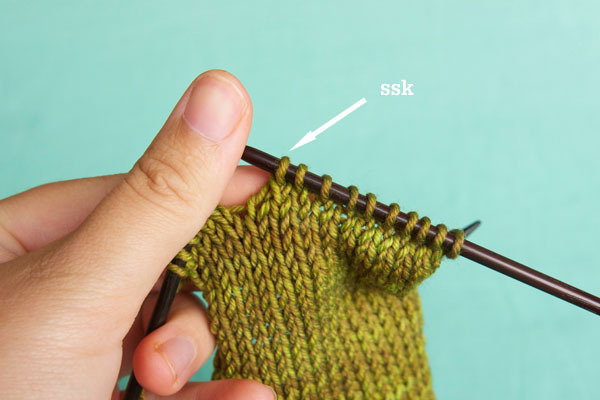 The ssk is used often in knitting as the opposite or counter or mirrored decrease to the k2tog (knit 2 together). It leans the opposite way – k2tog leans right and ssk leans left. 2. Slip 1 more stitch knitwise. 3. Insert your left needle through the front of the 2 slipped stitches. 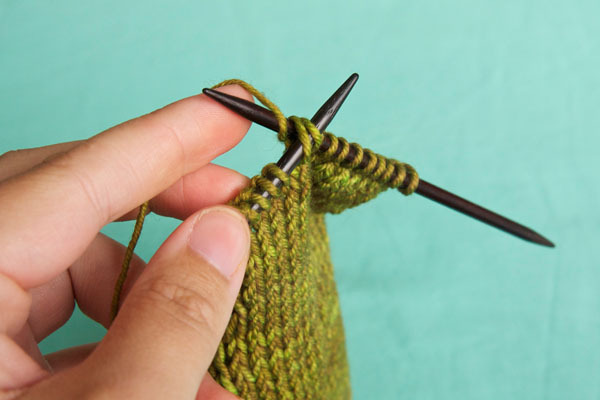 4. wrap your yarn around the right needle (it’s in behind) and pull the loop through both of the slipped stitches, knitting them together. This is what a completed ssk looks like. I also had a question on the ssk with the gothic lace- thank you for the easy to follow instructions- Barbarag. I am learning dbl pointed with the simple mittens-how do I stop a “run” in the mitten where I change needles? Hi Barbara – you want to give the first and second stitch after a needle change an extra tug. They are coming out a little loose it sounds like. I am knitting the polygon blanket. Round 1 says [ssk, purl to last 2 sts before marker, k2tog]. There are 18 stitches within each marker, so I end up with 3 stitches before the marker. If I have to knit the last two together, does that mean I just slip off the third to last stitch? Hi Stacy – I don’t think I understand. 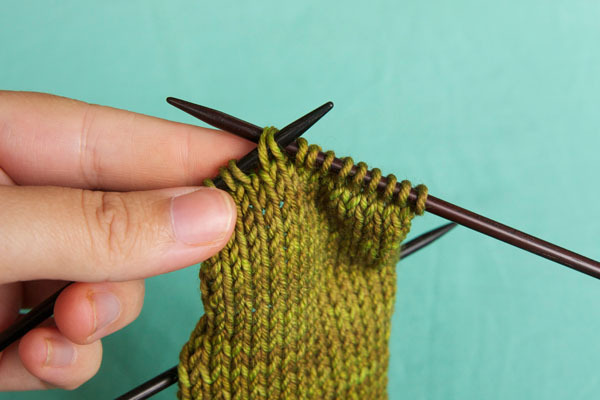 YOu are suppolsed to pur to the last 2 sts before the marker so if you are 3 sts before the marker you should purl one more then knit the last 2 sts together. I am knitting the easiest mitts pattern but I can’t see that at the decrease you get 4 sets less, it seems to be three only, is this an error in the pattern? Hi Linda – no error. You should have 2 markers in the pattern and each decrease round decreases 4 sts. What is the difference if you just knit two through the back loops instead of SSK? SSK lies a little bit flatter, because the stitches have been re-oriented when you slip them knitwise. But really, it’s pretty much the same thing! Well, Fiddlesticks, I have been doing this ALL WRONG! Thank you so much for the tutorials so I can go back & do it the right way. Hi, Sorry if this is the second note you are getting from me. I don’t think the other note went through. Do I decrease continuous for 5 rounds ( I am size 3x) or do I decrease every 6th row? 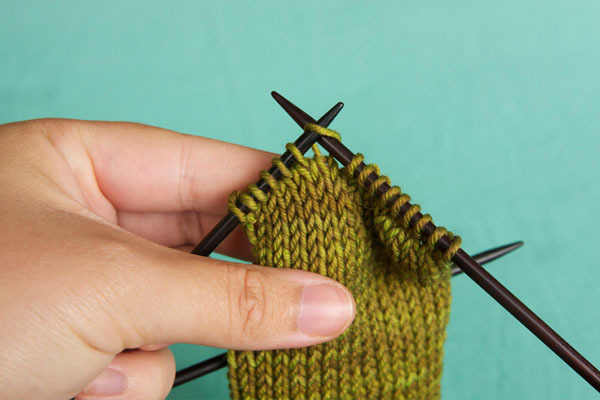 Hi – You are decreasing every 6 rounds, so there are 5 rounds of just plain knit in between. What a wonderful site this is. My mothers day gift to my Mum everything she needed to make your Thistle scarf, she was so pleased with it. She is almost 80 although very experienced, she couldn’t remember or didn’t know SSK, I don’t even knit but was able to tell her over the phone after looking at this site, everything is made so clear. I will stick to the crochet though, I love the wooden hook I bought.